Anderson & Vreeland collaborated with the narrow web industry and ESKO to develop this entry-level digital imaging system offering all the benefits of digital plates without the cost of unnecessary features. The narrow web industry asked for this so we worked with ESKO to have it made. This small footprint CDI makes it easier to transition to digital platemaking. It’s the right size with the right features at the right price. The CDI Spark 2420, a new digital imager specifically designed for the tag and label market to simplify transition to a digital workflow, is now available exclusively from Anderson & Vreeland, Inc., leading manufacturer and distributor of flexographic plate processing equipment and materials. Anderson & Vreeland collaborated with the narrow web industry and EskoArtwork to develop this entry-level digital imaging system that offers all the benefits of digital plates without the cost of unnecessary features. The benefits of digital platemaking are widely recognized, including print quality rivaling offset and gravure, print consistency, faster processing, reduced costs, and improved sustainability. “This small footprint CDI makes it easier to transition to digital platemaking. It’s the right size with the right features at the right price,” said Bill Bower, Director of Sales for Anderson & Vreeland. The superior plate quality of the CDI Spark 2420 is exactly what is required to achieve outstanding results: fine highlights, excellent details, and superb coverage in shadows. The CDI Spark 2420 offers flexibility as it is designed to match entry-level production needs and expand capabilities as your business grows. 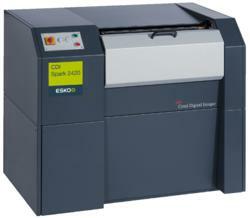 The CDI Spark 2420 images a full size 24" x 20" / 609 x 508 mm plate of arbitrary thickness in 23 minutes. It images with variable resolutions from 2000 to 2540 ppi, and is capable of screen rulings up to 200 lpi, with halftone imaging from 1-99%. The CDI Spark 2420 is equipped with a high power fiber laser for the highest quality and productivity, and comes with a vacuum drum for plate loading via tape. The proven optical concept of this CDI gives a maximum of reliability and consistency. For further information, contact your Anderson & Vreeland representative or visit http://www.AndersonVreeland.com. Founded in 1961, Anderson & Vreeland has earned an international reputation as a leading supplier of flexo platemaking equipment and materials to the graphic arts industry. The company offers a “systems approach” to plate processing, with state-of-the-art equipment, materials and software specifically designed for flexo. A&V supports these products with 50 years of experience and a nationwide staff of technical sales representatives thoroughly knowledgeable about the fine points of flexo. The company’s substantial flexo experience and technical support sets it apart from other prepress suppliers. This experience and support results in smoother and easier integration of technical advancements affecting flexo prepress. Further information is available on the web at http://www.AndersonVreeland.com.